Vilfo allows you to connect to VPN server using .conf and .ovpn configuration files. 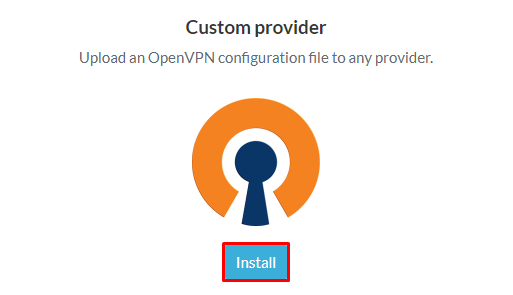 In order to connect to a VPN server using a .ovpn file, make sure that any additional keys and certificates are already inlined into the configuration file as Vilfo does not allow you to upload separate .key or .ca files. If you have any questions regarding configuration files, contact your VPN provider and ask them for a configuration file that has all certificates inlined. Press Update under the Credential fields. Your custom VPN provider is now setup and ready to use! Vilfo also allows you to make more advanced configurations for your connection. The name you select for your VPN provider here is the one that will show up in the list of available providers, as well as the drop-down under the Devices page. The description you set here is the one that will appear under the VPN Providers page in the Vilfo interface. If your VPN provider has a selection of different regions to choose from, you can add these under Regions. Any newly imported regions will be indicated by a green New message. Vilfo will automatically fetch the country the configuration file belongs to, but you can change it under Country if it is incorrect. Vilfo will automatically fetch the city, but you can change it under City if it is incorrect. If you made any changes to a region, press Update next to the region you changed. The country you choose will change the displayed number of countries under VPN Providers. With multiple regions added, you will be prompted with a new Region drop-down under the Devices tab when selecting your VPN provider. The name displayed for each region will be the same as the one you entered under City in step 5.